In line with its vision to offer a superior passenger experience and improve environmental performance through a modern and state of the art wide-body aircraft fleet, Emirates has retired the last Airbus A330 and A340 aircraft in its fleet from active service. This makes Emirates the first and only airline in the world to operate a fleet of all Airbus A380 and Boeing 777 aircraft for its passenger flights. Emirates recently retired A6-EAK from operational service. The aircraft was the last of the 29 Airbus A330 aircraft that had been operating as part of its fleet. Flight A6-EAK joined Emirates in 2002 and had flown for over 60,000 hours travelling close to 45 million kilometres in 14.5 years. That distance is equivalent to almost 60 return journeys between the earth and the moon. Emirates has also phased out A6-ERN, the last serving Airbus A340 in the fleet which had joined the airline in 2004, originally manufactured in 1999. Since January 2015, Emirates has retired 18 A330 and 5 A340 aircraft from its fleet. The average age of the Airbus A330 and A340 aircraft phased out from the fleet is 16.5 years- a figure which is well below the industry standard retirement age of 25 years. In addition to the aircraft that have been retired from active service since January 2015, Emirates plans to further phase out some 25 aircraft over the course of 2017 and 2018 to ensure that the operating fleet remains modern and efficient while offering customers a higher level of comfort and safety. The retirement of older aircraft is balanced by the induction of younger, more modern aircraft into the fleet. 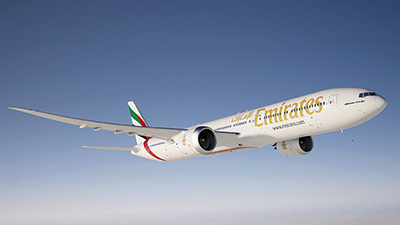 This has resulted in Emirates operating one of the youngest fleets in the industry with an average age of 5.2 years. The two youngest aircraft in the fleet- Emirates’ 85th A380- the first of the new generation A380 aircraft delivered in October 2016 and Emirates’ 125th Boeing 777-300ER- are less than two weeks old. Emirates’ fleet of all Airbus A380 and Boeing 777 aircraft will also have a smaller environmental impact as both aircraft types have better fuel efficiency and emissions performance than the retired aircraft.